DeepWater Buoyancy has been awarded a major contract to supply flotation to the University of Washington’s Applied Physics Laboratory for the cabled observatory component of the Ocean Observatories Initiative (OOI). The OOI, a project funded by the National Science Foundation (NSF), is planned as an integrated infrastructure of science-driven platforms and sensor systems to measure physical, chemical, geological and biological properties and processes from the seafloor to the air-sea interface. The company was selected after a competitive bidding and assessment process that evaluated product performance, technical specifications and pricing. DeepWater Buoyancy will be delivering more than 32,000 lbs. (14,500 kg) of DeepTec™ syntactic foam in support of the cabled observatory component of the OOI. Over 268 individual products will be provided as part of this sizable order including: 210 model CF-12 cable floats with titanium hardware, 15 spherical buoys in a range of sizes and 43 highly engineered custom fabricated parts–some exceeding 4000 lbs. of total uplift and depth rated to 3000 meters. DeepWater Buoyancy syntactic foam systems will be integral to the OOI cabled observatory’s studies of ocean circulation and seafloor dynamics, which require high-speed and accurate data acquisition in demanding, rapidly changing conditions. DeepWater Buoyancy’s proven product integrity, stability and performance at depth were a critical part of the University of Washington’s decision to select the company. The University of Washington is leading the design, construction, and early operations of the regional cabled observatory (Regional Scale Nodes) component of the OOI. Innovative high-bandwidth instruments, connected to the 575-mile network of electro-optical cables, will be installed on the seafloor and in the water column at study sites in the Northeast Pacific Ocean off the Oregon and Washington coasts. “The networks will be moving data at rates exceeding tens of gigabits per second, and will be served by tens of kilowatts of power. These high rates demand precise, stable platforms that can hold up to intense subsea pressure. The performance of DeepWater Buoyancy flotation systems at such depths is critical to our project’s success,” stated Chuck McGuire, Lead Systems Engineer at the University of Washington Applied Physics dev. DeepWater Buoyancy secured the designs and manufacturing rights to a select group of former Flotation Technologies products, and has been manufacturing and enhancing those systems from a new facility in Biddeford, Maine since January. Current customers include the Woods Hole Oceanographic Institute, Scripps Institution of Oceanography, Bedford Institute of Oceanography, FMC Technologies and Oceaneering International. 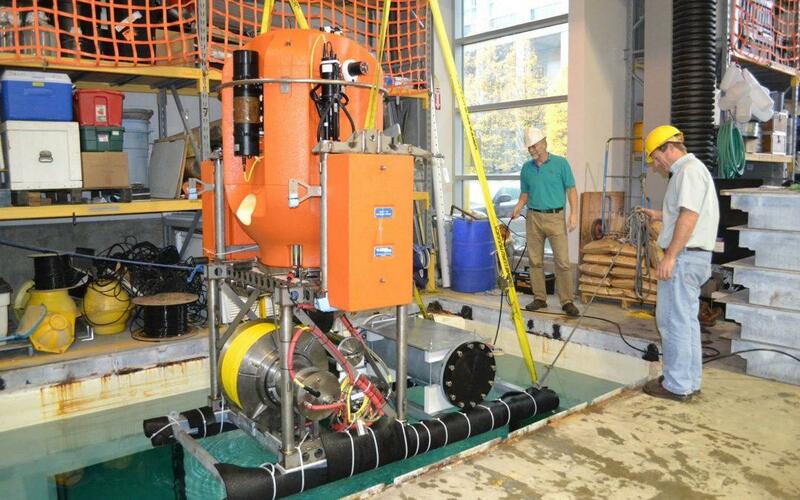 The initial shallow profiler undergoes testing at the University of Washington. DeepWater Buoyancy’s syntactic foam systems (in orange) will provide uplift and platform stability for the Regional Scale Nodes portion of the Ocean Observatories Initiative. Photo: Mitch Elend, University of Washington. To download a PDF of this press release CLICK HERE.